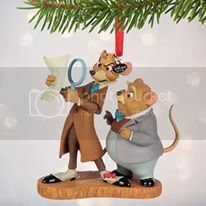 Description: Similar to the WDCC set, A Curious Clue, Basil of Baker Street and Dr. Dawson appear as a 2016 Christmas ornament. Where can it be purchased: From the Disney Store. The item is currently not available, but keep checking their web site to see if more arrive in stock.